2013 Interns Mitch and Ramsey with some heavy metal. The Vintage Band Festival is an exciting 4-day international music event. Last year’s festival took place August 1-4, 2013, and celebrated the music and the instruments of past eras. We are anticipating the next large festival, which will take place July 28-31, 2016. The VBF is held in Northfield, Minnesota, the historic, charming river town known for its colleges, art, pubs, restaurants, and music. The performances take place in many outdoor locations all around Northfield. In case of inclement weather, alternate indoor sites will be announced. Many attendees bring a bicycle and a folding chair. This is the most historically authentic way to get around to the concert sites. A sun umbrella is also useful. Some of the bands are dressed in 19th Century clothing and some festival goers do the same. Check out the historic horn exhibit at the Northfield Historical Society. There will be a Battle of the Bands and a Massed Concert following. Vintage “Base ball” takes place with a band playing, of course! Hotels, motels, and B&Bs in Northfield and nearby communities. Dancing! There will be a Vintage Dance (cotillion) on Saturday night- and some spontaneous street dancing too. 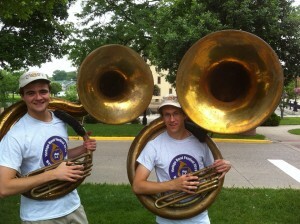 Travel Accommodations: http://vintagebandfestival.org/festival/travel-info/ and http://www.visitingnorthfield.com/. For travel itinerary suggestions, go here. The Vintage Band Festival is a non-partisan, non-profit community organization. For a full list of the VBF band roster, go here. The schedule can be found here. In the event of excessive heat or rain, and in any instance of lightning, outdoor concerts will be moved to rain locations which will be posted shortly. The 2013 Vintage Band Festival was held in conjunction with the Historic Brass Society’s Early Brass Festival. The Vintage Band Festival is a part of a summer schedule of arts activities in Northfield which features graphic arts, dance, theater and music.